Black Mission Fig & Arugula Salad!! So I entered a contest this weekend. It’s a cook and snap. Bascially you cook a meal from a Restaurant in Center City Philadelphia of your choice. You follow the recipe, prepare it and take a picture of it and submit your entry. 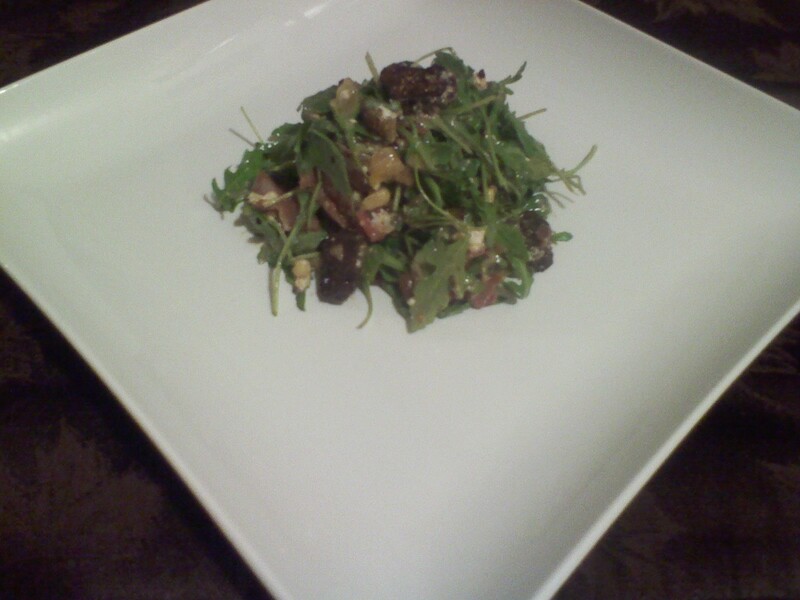 I choose the Black Mission Fig & Arugula salad from La Scala’s in Philaadelphia. It turned out amazing. Now the voting begins by the Chefs. Let me know what you guys think. Previous Post Beer Cap Art!! Next Post Cordon Bleu That You Can Do! Where are your recipes? I only see a description of the dishes. My wife and I would love to try to make your recipes, especially your family dishes. We love trying out foods from other ethnicities. MMM! I’d love recipes too! Can you send me a link to this contest? I’d love to participate. That’s awesome you entered the contest. I was going to, but I ended up not getting the ingredients in time to cook and submit. If I had done it, I would have gone with the chili or ratatouille (ever since I saw the movie, I’ve wanted to cook this). I still plan on cooking them, though! Delish! Where can I find the contest?? Thanks….Entries had to be sumbitted by January 8th.